There are definitely easier ways to read the classics, a bible, or contemporary works than to squint through a magnifier at the pages of a miniature book. But the awe and fascination at seeing the fine workmanship and talent involved in the production of these tiny treasures is well worth the initial effort. 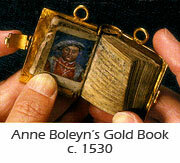 Miniature books generally measure three inches or smaller, with those under an inch considered micro-miniatures. There are few requirements for their content, but whatever they contain has required a gargantuan effort in production and execution, including hand-colored or drawn illustrations and clear text. The first efforts at miniature publications began nearly 4,000 years ago in and around Babylonia and Mesopotamia, or present day Iraq. 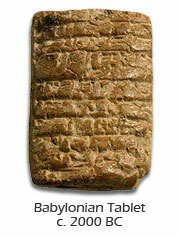 Small clay tablets containing tiny characters indicating transactions between parties were used and carried for convenience. As paper replaced the carved clay tablet, tiny scrolls made their appearance, such as in 700 AD, when the Japanese Shogunate distributed these to the populace. Throughout the Middle Ages, tiny prayer books called Book of Hours were hand printed and illustrated for use by monks in their daily reverence. Miniaturized religious works were also convenient when concealment from critical eyes became necessary. 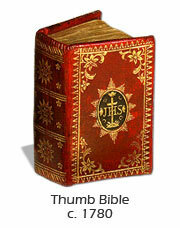 Once Gutenberg's printing press was created in the 16th century, printed thumb bibles grew in popularity for both children and adults. As the Renaissance blossomed, fine miniature books covering many topics came into vogue, and by the 19th century, the likes of Napoleon Boneparte had assembled a miniature library which accompanied him on his conquests. Libraries of tiny books were also available to children beginning in the early 1800s, which contained songbooks, fables, religious works and classical literature, all meticulously rendered for the small hand. 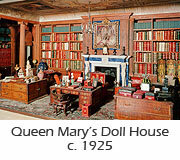 The most important collection of miniature books was commissioned and created for Queen Mary, the wife of King George V of Great Britain for her impressive Royal Doll House in the early 1920s. As the 20th century marched on, the workmanship of miniature books were showcased by various printers throughout Europe and America. Not only were books produced from engraved type, but photo reduction was utilized in the creation of even smaller works. These were still largely created for children and were remarkably detailed in their execution. 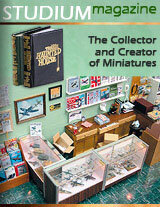 The latter half of the 20th century became known as the renaissance of miniature book publishing and collecting. Small publishers created limited runs of their works, artisans displayed their skills on tiny pages, and computers began playing an important role in the creation of books in miniature. As technology increased, so did the further miniaturization of words. 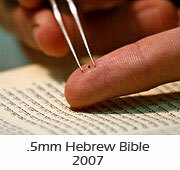 As of December, 2007, the smallest publication is a computer silicon chip smaller than the head of a pin (.5mm square) that contains the entire Hebrew Bible. All one requires to read it is an understanding of the language and an Electron Microscope. Over the last 4,000 years, miniature books and their brethren have fascinated and educated. They have demonstrated the artisan's skill and inspired the collector of the small. Above all, the minute works through time have clearly demonstrated the one thing both the producer and collector must possess in their endeavor for quality and substance...patience.